Are you Any Good At Sketching??? I don't think that I am... unless I can see the item in front of me and then it has to be something relatively easy. Oddly enough, if I can't see it, I can't draw it. It's as if I know what it should look like, but the image never crossed over into my long term memory. Can you remember the last time you tried to draw?? That I can remember!! It was a staircase that I saw in a gallery years and years ago! I was thinking how awesome a painting would be of a staircase that changed direction and twisted and turned upon it's self. It didn't turn out well at all!! Maybe I should stick to flowers lol! @hate2iron This is my only masterpiece. 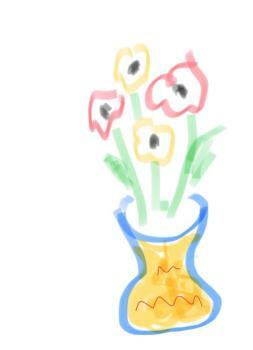 In case you are unsure and don’t like to ask, it’s flowers in a vase from my “high on Absinthe” phase. @xFiacre That's not bad, you know! I mean it. You should drink Absinthe more often. @MALUSE Ok. I’ll try when I’m In Normandy next month. I guess I have to be in the mood lol! After so many years of art classes, you would think that I would be better!! I am pretty good, I do all the time, while I talk on the phone with someone. Maybe I have to learn to talk on the phone... which I hate doing lol. Or, I need to find a pass time that would allow some art as I concentrate on what ever the other thing is ! @Hate2Iron I also hate to talk on the phone, but sometimes I have, just to keep in touch with family members. I am the same way. If I cannot see it, I cannot draw it. @Hate2Iron I think we both could handle abstract. Sometimes I can sort of copy something but mostly I'm pretty useless at drawing. I guess you either have to spend hours and hours practicing... or you inherit the talent! LOL... I sometimes think the same thing! I must have last tried when I was in school and it was not good at all. @Hate2Iron I had tried my hand at music and that too was not too great. Yes, I am. I don't know why you find sketching something you have in front of your eyes not as good as sketching from memory. @Hate2Iron How can you draw an object in perspective if you don't see it? I'm more of a doodler. I'm going back to doodling I think. I like my doodles a lot better!! last time I tried was 10-11 years ago in high school, in my arts class. I am terrible. Sketching is something that I haven't tried since I was at school. I did some sketches in the last days. I was visiting an ancient city, Cusco, Peru, and there are many narrow streets in the city. I used for sketching a little notebook, sized 4"x3" and a line pen. You can do sketches everywhere, by sitting in a cafe or in the park, while travelling too. It´s a matter of practice. By sketching you shouldn't care of details. Most important are the proportions and light and shadow, the values. Details aren't so important. Your and my condition are same. I can draw well but by seeing the photos. Without seeing anything its totally impossible for me. I am not an artist but love drawing which was my hobby 8 years back. im the same as you when it comes to drawing.. hehe.. maybe the last time that I draw is 2 years ago.. I can't draw, but I took an art class when I was in the 9th grade. I love it. It was the only class I had with my best friend. Once in awhile I can draw something pretty cool. The last time I painted my son's church was because they were looking for him at school. It turned out pretty well.